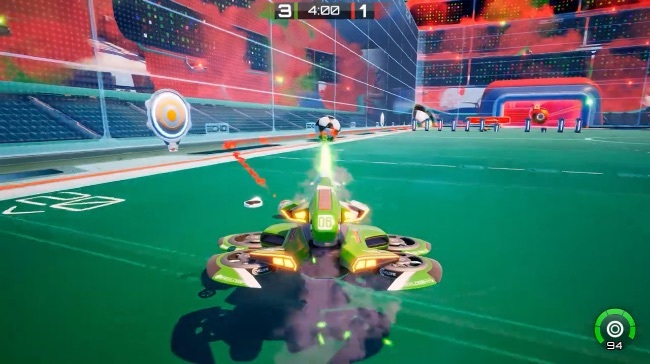 Previously featured on Alpha Beta Gamer during the closed Beta sign up, the core gameplay if Axiom Soccer is similar to Rocket League, with teams of players in vehicles attempting to knock an oversized ball into the opponent’s goal. However there are some differences that significantly alter how the matches are played that make for a very different experience. The vehicles are a little slower, but thanks to the fact that they’re not confined by wheels, they’re far more maneuverable than in Rocket League, with them able to move in all directions rather than just forwards and backwards (you can’t strafe in Rocket League). You also have a gun with different fire modes which you can shoot at the ball to knock it around the arena – in fact this ends up being the primary way of knocking the ball around rather than hitting it with your vehicle. There are significant differences in the arena too, most noticeably the introduction of goalkeepers, corner bumpers and activateable barriers. The bumpers knock the ball out from the corner into the play area and the barriers are rows of bollards that you can summon by shooting at special plates at the side of the arena. The goalkeeper is a large disc shaped object that sits on the goal-line and players can move it by aiming and pressing the middle mouse button. It’s a great feature that means one player doesn’t have to sit in goal for a whole match and also makes 1v1 matches a fun experience. It would be easy to write off Axiom Soccer as Rocket League with guns, but it’s much more than that. A lot of thought has gone into refining the features of Axiom Soccer to make it feel like an evolution of Psyonix’s popular vehicular soccer game rather than a clone of it. A hover-tank based arena soccer well worth training your sights on.